European Commission vice president Frans Timmermans has confirmed that vexatious judgments from countries outside the EU “remain governed by national laws”. In a letter to MEPs from different political groups who have proposed EU laws to address the practice of SLAPPs (strategic lawsuits against public participation), Mr Timmermans reiterated that the recognition and enforcement of such suits was governed by member states. 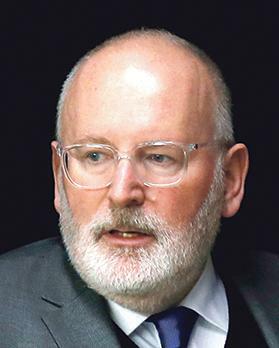 “Brussels 1 Regulation applies solely between EU Member States and does not create obligations to recognise and enforce judgments from non-EU jurisdictions,” Mr Timmermans said. The vice president went on to add in his letter that the Commission would continue to follow developments in Malta and “defend and protect media freedom and pluralism within its competences”. His comments echo similar ones made by European Commissioner for Justice Vera Jourová this week in reply to a parliamentary question by PN MEP David Casa. He forms part of the group of Europarliamentarians who have been pushing for Brussels to address the issue. The government rejected an anti-SLAPP amendment proposed by PN MP Jason Azzopardi to the new Media Bill on the basis of incompatibility with EU law. Justice Minister Owen Bonnici has repeatedly stated that based on legal advice sought by the government, introducing the anti-SLAPP amendments would have violated EU law. With respect to third countries, Dr Bonnici has asserted that anti-SLAPP measures were already in Maltese law, which protected journalists from SLAPP cases from countries like the US and that legal advice obtained from both local and foreign experts demonstrated that such protection already existed. SLAPP lawsuits are designed to silence and intimidate critics by subjecting them to lawsuits in foreign jurisdictions. Almost all independent media houses in the country have been faced with the threat of such ruinous suits, including the Times of Malta. Slain journalist Daphne Caruana Galizia faced similar threats from passport concessionaires Henley & Partners.